At Dartmouth, systemic preference for students from privileged backgrounds forms an integral aspect of student life. From the moment students arrive on campus, they hear reminders of the remarkable concentration of excellence here at the Big Green. During New Student Orientation each fall, incoming freshmen and transfer students listen as speakers describe how each student’s distinction in school, community service and extracurricular activities led to their selection from a competitive pool of applicants. Yet students do not arrive at even playing field when they come to Dartmouth. Those who attended top high schools and took AP and IB exams, for instance, can sometimes bypass prerequisites for some classes, affording them entry into upper-level classes that are harder for other students to attain. In doing so, these advantaged students gain immediate access to opportunities that benefit their intellectual development — opportunities less accessible to students from less affluent backgrounds. Advantages for privileged students don’t just manifest themselves in the classroom. Some social scenes around campus are inhospitable to students from marginalized backgrounds. Examples include varsity and competitive club sports teams and Greek houses. 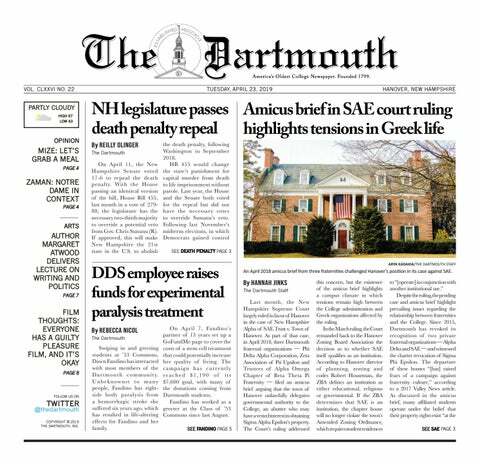 The application process for many of these groups is much more favorable to those who had the luxury of cultivating much-needed social skills prior to coming to Dartmouth. Academic and social structures at Dartmouth have created a campus culture that favors children of the elite. Even though they may have exemplary intellect, marginalized students start their college careers without the same preparation of their affluent peers. Some marginalized students work multiple jobs on campus to pay for school or basic necessities, forcing them not to participate in extracurricular activities. Oftentimes, these students do not have the luxury of working in a research lab or putting in a few hours a week as an officer in a club. Even when marginalized students do manage to make their way into the realms of clubs and other activities, the opportunity costs associated with doing extracurricular activities can be burdensome. These everyday realities underscore the role that privilege plays in a students’ experience at Dartmouth. For those who benefit from their privilege, these social and academic structures may seem ordinary. Yet, for those who most acutely feel their bias, these structures serve as a daily reminder of exclusion. Paradoxically, the very institution that should provide a path towards socioeconomic mobility preemptively disadvantages the students who need it the most.